At the recent Volunteer Firefighters of Canada conference sponsored by the CVFSA and hosted by the Kings County Firefighters Association an Honorary Life Membership was awarded to Martin E. Bell. Martin Bell’s commitment to volunteer firefighting started as a spark more than four decades ago and became enflamed into an overwhelming sense of duty. 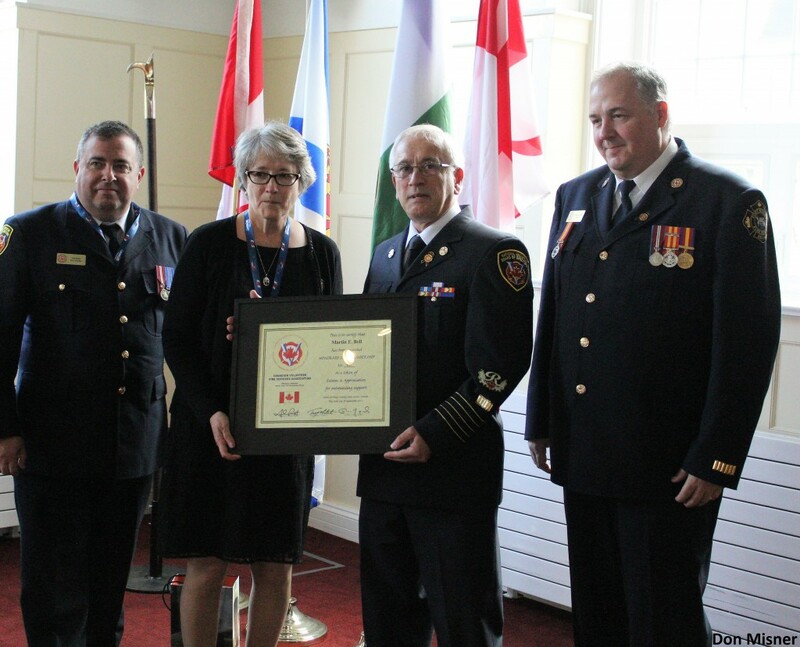 That commitment has just earned him an Honorary Life Membership awarded from the Canadian Volunteer Fire Services Association (CVFSA), which was presented to him at Acadia University on September 30th 2017. This is only the fifth such award that the CVFSA has awarded in the last 18 years. The CVFSA works on behalf of the 3,492 fire departments in Canada and is the voice of the 144,000 volunteer firefighters in our nation. Martin has been a volunteer firefighter for 42 years and a member of the CVFSA for the past 18 years, serving on the association’s national Board for 17 of those. He spent three terms as President and has acted as the chief administration officer for the past four years. Martin said, “It started out as just being able to do something in my community, and then over the years it just continued to grow. It has taken on a whole different dynamic that I never expected it would. Over the years I truly enjoyed working with a group of fire service leaders from across the nation”. Martin was recognized for the many projects he has worked on over the years. In the words of Graham Pawlett, National President of the CVFSA, “Bell was instrumental in assisting with the Volunteer Fire Tax Credit for which Bell made numerous networking trips to Ottawa working with various MP’s, the former Finance Minister Flaherty and Board members of the CAFC. He also chaired a committee to host the Canadian Fallen Firefighters Foundation Memorial Weekend in Ottawa in 2014. In 2015 he was one of the lead persons re-writing the By Laws for the National Association”. When Martin was presented his award at the Annual Conference he invited his wife, who was seated in the audience, to come up and share the award with him for her years of support in helping him be able to give of his time and for her understanding.